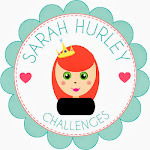 Hello and welcome to the Sarah Hurley inspirations blog. I decided to create an Easter party collection, not only is it fun but it's so easy to do. I hope you enjoyed today's post and be sure to come back soon for more inspiration from the rest of the design team. Oh my goodness these are wonderful. What a brilliant idea if you're having an Easter get together. Fabulous way to use that paper. The colours work brilliantly, a lovely set of decorations.